By Aaron Hennessy | May 10, 2013. The Liberties is host to some of Dublin’s most vibrant nightlife areas. Offering a wide spectrum of choice, the area caters to all. The Camden Street area, which is adjacent to the Liberties, is one of the most popular destinations in terms of nightlife. It is best known for its nightclubs, of which it has some of Dublin’s finest. The two main clubs are The Palace and The Village, which each draw over 1,000 people respectively to the street on a good night. These nightclubs, of course, are only one facet of nightlife in the Liberties — live music is also an option for those seeking something different. Vicar Street is the most obvious destination for music lovers, being Dublin’s premier medium sized venue. Located across from NCAD, it hosts both national and international acts throughout the year. Sticking to live music, Whelan‘s of Wexford Street is famous for its personal setting. The pub has two venues – upstairs and down – which operate simultaneously and continue to draw impressive acts new and old, national and international. 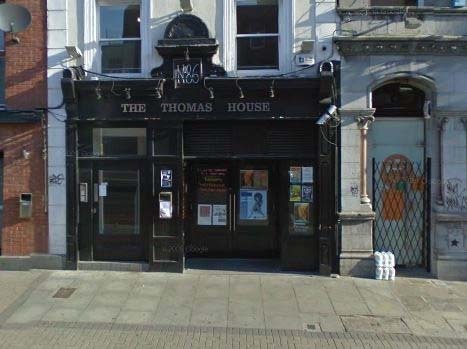 Venturing back to Thomas Street, the Thomas House is perfect for that not-so-quiet-pint. The music bar caters to music lovers of different creed: the tunes vary from punk to sca, indie to reggae. Offering an open door to “miscreants and weirdos”, they also carry an impressive variety of foreign/ craft beers which alone make the pub worth visiting. Continuing the craft beer trend is The Little Green cafe, bar and art gallery on High Street (just a few doors down from The Thomas House). This quirky bar, the decor reminiscent of a Wes Anderson movie, is a perfect spot for lunch, an after-work drink or – if in the mood – to idle away a few moments appreciating any of the art or movies they regularly show. Of course, there are those who prefer a pub to play a more traditional role, an offer of solitude. Fallon‘s is the embodiment of such sentiment. Located near The Coombe, Fallon’s – doling out legendary Guinness – is an Irish pub in the traditional sense of the term.